Columbia Police Chief Skip Holbrook cautions citizens not to fall victim to a phone scam involving a false representation of law enforcement asking for money. 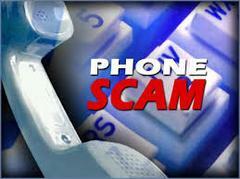 The recent scam is similar to one that was first reported to CPD last June. Concerned citizens calling from various area codes have notified CPD that an unknown person indicates that a law enforcement matter needs to be resolved immediately. The caller threatens the victim or a relative with an arrest or hefty fines if they don’t pay him. The scammer indicates that he is a law enforcement officer and often times provides a real name of a police representative from various local, state or federal agency to make the phone call appear to be legitimate. The caller advises that he will send an officer to an agreed upon location to collect the money. While CPD has not received a lot of complaints, the caller may leave a real call back number for a police agency. In other instances, fraudsters may use technology to disguise the real number on caller ID. These are attempts to try and hide the scammer’s true identity and prevent the victim from calling back to verify the call. * If someone you don’t know asks for money over the phone, do NOT comply. Tell them not to call back. * Do not engage in a lengthy conversation with the caller; Hang up the phone. * If the calls continue, keep a detailed log of the times, topic and demands, then provide local police with the information to aid in the investigation.